Soma Surf Resort lies in the heart of the best surf breaks Nicaragua has to offer! Enjoy world class surfing, guided surf excursions, yoga, natural hot springs, tidal pools and more. Soma has a full service restaurant serving fresh fare with a distinct flavor using natural ingredients where you will truly savor the “farm to table” experience. 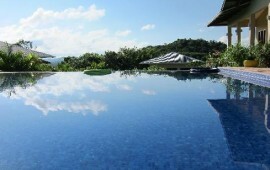 Enjoy the infinity pool an open air rancho with hammocks, free WIFI plus many more amenities. Soma is a resort sustainably built and a portion of the proceeds benefit local charities. Prices are per person, based on double occupancy. Prices do not include airport fees and departure taxes, The airfare portion of the itinerary price is based on midweek departure. Airport fees and surcharges vary by departure city and destination. Airport fees can add up to $128 to the total package price. Prices will vary according to departure cities and travel dates. Air fares are subject to change without any previous notice.